Greta Garbo as Christina, Queen of Sweden. 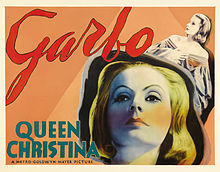 Queen Christina is a 1933 biographical film about Queen Christina of Sweden, who is a popular monarch who is loyal to her country. However, when she falls in love with a Spanish envoy, she must choose between the throne and the man she loves. Directed by Rouben Mamoulian. Written by H. M. Harwood and Salka Viertel, based on a story by Salka Viertel and Margaret P. Levino. [disguised as a man] Stop fighting. I'll tell you the truth. Well gentlemen, I have the painful duty of telling you that you're both wrong. Sixes and the nines. The truth is that the queen has had twelve lovers this past year, a round dozen. [To Don Antonio] Any lie will find believers as long as you tell it with force enough. Why? Do I peer into the lives of my subjects and dictate to them whom they shall love? Will I serve them less if I'm happy? What strangely-foolish title is it that calls me ruler. Even what concerns me most dearly, I am to have no voice. It is intolerable! There is a freedom which is mine and which the state cannot take away for the unreasonable tyranny of the mob, and to the malicious tyranny of palace intrigue. I shall not submit! Know this, all of you. My business is governing and I have the knack of it as you have yours for your trade by inheritance. My father was a king, and his father before him. My father died for Sweden and I live for her. Now my good people, go home to your work and leave me to mine. My blessing on all of you. The question of the succession has long been the subject of my earnest consideration. I am come here today to tell you my decision. There is one among us who has served the state faithfully in war and peace, one who is also related to me by blood. I speak of the Prince Palatine Charles Gustavus. I believe I shall be in agreement with you in saying that above all others, he is the man best fitted for the government of this kingdom. The Prince has done me the honor of asking my hand in marriage. The Prince has my answer. I have given him the reasons why I cannot accept this offer. In the absence of an heir of my blood, our Constitution gives me the right to nominate for your approval my successor. I believe no one would gratify your wishes better than Prince Charles Gustavus. I am resolved, therefore, here and now, to place in your hands my abdication from the throne of Sweden. And now, farewell. I thank Almighty God who caused me to be born of a royal stock and raised me to be a Queen over so large and mighty a kingdom. I thank too those nobles who defended the state when I was a child and all of you for the fidelity and attachment you've shown. Let me look at you once more. And so, let me remember you with love and loyalty until memory is no more. God bless you. Farewell. Lord Chancellor: [whispering] ...to wage it with courage. Christina: We promise to win it! I bless you all. Archbishop: [arguing for war] It is for our faith and for our God. Christina: God is being invoked in many lands these days, Your Grace. What about the enemy's God? Christina: But Chancellor... [She looks out the window] Snow again, eternal snow. Christina: Must we live for the dead? Christina: [about Charles] He at least is no opportunist...I look at you and I look at a stranger, a stranger whom I do not altogether like. Don Antonio: [mistaking her for a man] Have you ever traveled? Have you ever been far from home? Have you ever been homesick? Christina: I've never been out of Sweden. Don Antonio: Then you don't know what it is to be homesick. You don't know what it means to feel that sense of loss, the pain of nostalgia. Christina: One can feel nostalgia for places one has never seen. Don Antonio: Yes, that's quite true. Young man, that's the second time I've underestimated you...Imagine in this ice-cap finding someone who knows Spain. You understand I admire your country. It's rugged and strong and impressive. It has all the virile qualities...At home, our people are less hearty. They're a bit more graceful. It's all a question of climate. You can't serenade a woman in a snowstorm. All the graces and the arts of love - the elaborate approaches that go to make the game of love amusing - can only be practiced in those countries that quiver in the heat of the sun, in the still languorous nights where every breeze caresses with amour. Love, as we understand it, is a technique that must be developed in hot countries. Christina: Sounds glamorous and yet...somewhat mechanical. Evidently, you Spaniards make too much fuss about a simple, elemental thing like love. We Swedes are more direct. Don Antonio: Don't you believe in its possibility? Christina: In its possibility, yes, but not in its existence. A great love, a perfect love is an illusion. It is the golden fable of which we all dream. In an ordinary life, it doesn't happen. In ordinary life, one must be content with less. Don Antonio: So young, and yet so disillusioned. Young man, you're cynical. Christina: Not at all, merely realistic. Christina: I'll give up my room to you gladly. Don Antonio: Give up? I wouldn't hear of it. Christina: Well, the truth is, uh, please forgive me sir, but since I was little, since I was a child, I've always disliked sharing my room with anyone. So you take the room and I'll go elsewhere. Don Antonio: I wouldn't hear of it. There isn't another free bed in the inn. Christina: Well, I'll sleep before the fire. Don Antonio: Am I so unpresentable? Do my manners disgust you? Does my speech bore you? If you find me so unbearable, forgive me for having imposed myself on you for so long. Good night, sir. Don Antonio: Say no more about it. I shall sit before the fire all night. Christina: Oh no, no, I-you couldn't. I wouldn't, uh... You shall share my room with me. Don Antonio: Oh, thank you very much. I'll be delighted. If you're ever in Spain, I'll return the hospitality. Elsa: [To Christina] Shall I help you off with your boots, sir? Don Antonio: You're very pretty, Elsa. Are you also good? Elsa: When I do not like a man, yes. Don Antonio: The basis of all morality in a sentence. Elsa: Can I get you anything, sir? Elsa: The master says you're to have everything you need. Elsa: If you should need anything, my room is at the end of the passage. Don Antonio: She prefers you. You have the better chance. Christina: I'd give her up gladly if you're interested. Don Antonio: No, I'm not interested. Well, don't you think since we're going to share the same bed we should be introduced? Don Antonio: What are you doing? Christina: I have been memorizing the room. In the future, in my memory, I shall live a great deal in this room. Don Antonio: You wait. I'll show you the whole living world. Christina: I have imagined happiness but happiness you cannot imagine. Happiness you must feel, joy you must feel. Oh, and this great joy I feel now. Antonio. Christina: This is how the Lord must have felt when he first beheld the finished world with all his creatures breathing, living. Don Antonio: And to think a few snowdrifts might have separated us forever. Christina: We might have been born in different centuries. Don Antonio: No, I never would have permitted that. We're inevitable, don't you feel it? Christina: Is there not in every human being? Don Antonio: Yes. Tell me, you said you would, why did you come to this inn dressed as a man? Christina: In my home, I'm very constrained. Everything is arranged very formally. Don Antonio: A conventional household. Christina: Very. I like to get away from it sometimes, to be free. Don Antonio: I can understand that. Christina: You're going to court. What if the Queen keeps you there? Don Antonio: Let her try. Don Antonio: After you, she'll be tiresome. Ah, to have found anyone in this wilderness would have been miracle enough but to have found you - ah, this is too improbable. I don't believe in you. You're an illusion. You'll vanish before my eyes. Christina: Antonio, I feel just the same. Don Antonio: I don't. I feel unlucky being the thirteenth. Christina: Oh, but I was lying, terribly. And now you don't love me anymore? Don Antonio: Don't despair, your Majesty. My master, the King of Spain, has the honor of asking your hand in marriage. It isn't pleasant to betray one's King, to dishonor him in a far country. Don Antonio: Why did you go out of your way to make me ridiculous? All that idiotic talk of love and beauty that made my heart beat, and made me dream like a fool and talk like one. Christina: I thought you would understand when you saw me again what had happened. That it had been so enchanting to be a woman, not a Queen, just a woman in a man's arms. Don Antonio: Yes, if you'd left my heart alone. Christina: But I fell in love with you. I love you Antonio. Look! [She pulls a coin from her bodice] The coin you gave me for helping you. I've slept with it in my hand each night. Forgive me for being a Queen. Don Antonio: What do you want of me? Christina: What do I want? What? I want back that room in the inn, the snow that fell, the warm fire and the sweet hours, beloved one. Christina: There is too great a burden you put on me. I have grown up in a great man's shadow. All my life I've been a symbol, a symbol of eternal changelessness, an abstraction. A human being is mortal and changeable with desires and impurities, hopes and despairs. I'm tired of being a symbol, Chancellor. I long to be a human being, this longing I cannot suppress. Chancellor: And yet you must, you will. His hand is upon you, the King's. Christina: I have always listened to you with awe, Oxenstierna...Yet something in me cries out that this cannot be true, that one must live for oneself. After all Chancellor, one's own life is all one has. Chancellor: Yes, your Majesty, that is all one has. Therefore, you must give it up to your duty. Greatness demands all. Christina: Am I great, Chancellor? I feel so little and helpless and futile. Chancellor: Yes, your Majesty, when you are alone. But tomorrow when this great hall is filled with the pride of your realm, you will meet the occasion, you will do your duty, you will marry Prince Charles. Chancellor: My heritage, your Majesty, and yours. Don Antonio: Have you said goodbye to your country? Christina: Yes, to everything but you. Don Antonio: How sweet your eyes are. Christina: Shhh, you mustn't talk. Don Antonio: When the wind is with us, we sail. Don Antonio: Spain - my home is on a white cliff overlooking the sea. You'll never leave me, will you...? Christina: Shhh, you must rest. Rest.